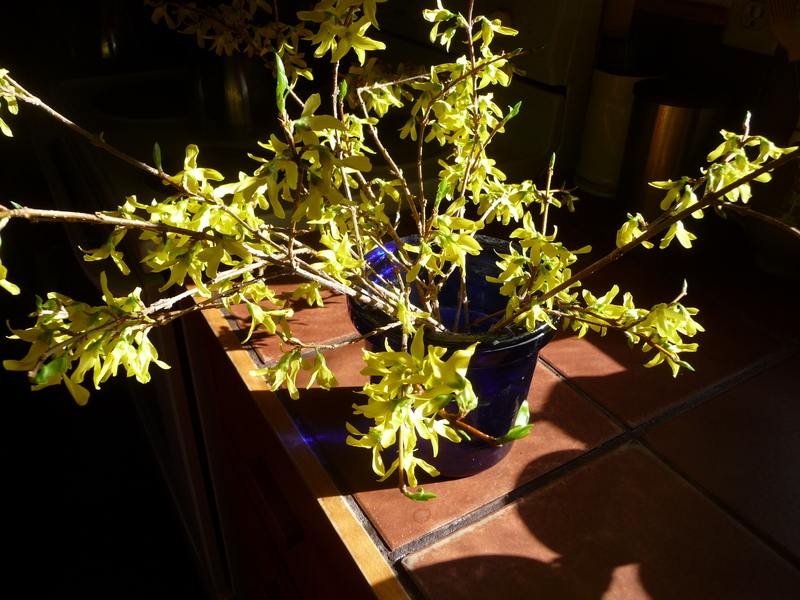 I left my desk a few minutes ago and saw this pot of forsythia lit up by the sunlight flooding into the kitchen. The camera kept warning, Backlight, backlight, as though that was something you wouldn’t want. We’ve waited a long time for this sunlight and I’m not going to filter it out now. Anyway, there was such clarity in the colours — the yellow forsythia, the deep blue glass pot. (The brown clay tiles on the kitchen counter…) And I wanted such clarity. All morning I’ve been struggling with some writing, trying to write about Pascal’s triangle (I do understand this: it’s a triangular representation of binomial coefficients) and how (I think) it can also be used as a model for talking about heredity. I’m trying to work backwards on a particular element of genetics, tracing how a certain member of my family has been gifted with an ability for which there doesn’t seem to be a precedent. So I look at these diagrams and their attendant theorems and feel lost at sea somehow. But I do mean to figure it out. Before I began voice lessons 6 years ago, I wouldn’t have understood the slight shifts in pitch, or vibrato, so maybe there’s hope. ~ by theresakishkan on March 26, 2014. What gorgeous light! Best wishes on your thought quest! This entry was posted on March 26, 2014 at 5:34 pm and is filed under Uncategorized.You can follow any responses to this entry through the RSS 2.0 feed.You can leave a response, or trackback from your own site. Previous: what do they see?